We are currently using the force:canvasApp lightning component to embed an external site securely into Salesforce. The Spring '19 release is introducing Lightning Web Components as the future of Lightning development for Salesforce. If we wanted to convert our existing force:canvasApp component into the new LWC Model, what are my options? Is there a different way altogether to embed external sites securely into Salesforce with the new LWC Model? Hence for few more releases I think you will have to use the force:canvasapp and the aura bundle . Not the answer you're looking for? 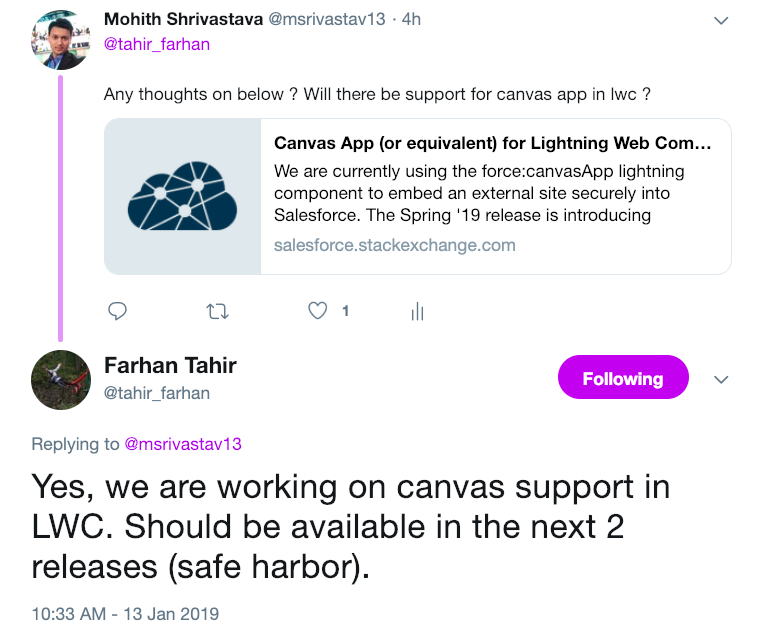 Browse other questions tagged lightning canvas lightning-web-components canvas-app or ask your own question. What is involved in moving over to Lightning Web Components? What are the equivalent of obtaining global and local IDs (via getGlobalId and getLocalId) for Lightning Web Components?